In Autumn 2012, I first encountered the vast Asian Ethnographic Collections held at the British Museum. I knew the collections were considerable, but nothing could prepare me for T1: a cavernous space with the windows blacked out, the walls clad in glazed tiles and my footsteps echoing as I walked through it. The floor was filled with bay upon bay of metal storage racks that were, in turn, being filled with tens of thousands of ethnographic objects from across Asia. One of my jobs was to work out a coherent system to organise all of this material. Thus far, the only thing I had organised was a small, albeit packed room of material associated with the Annals of Human Genetics Archive at UCL. Needless to say, I panicked. Then I got on with the job. The sheer range and number of objects was breathtaking, but as I trekked back and forth across the store to identify, register and explore the collections, both the space and the material gradually became familiar. I was immersed in painted rickshaw panels from Bangladesh, Javanese shadow puppets, Sri Lankan Sanni Yakuma masks, delicate leaf plates from Nepal, bows and arrows from across Asia, and endless models of ships and agricultural tools. Alongside the organisation of the collections, I also had the opportunity to research any part of them that sparked my interest. My Head of Department at the time, Jan Stuart, suggested that I might present this research to the Department and Neil MacGregor, who was then the Director. At the time, I was the newest and most junior member of the curatorial staff and this was my first full-time job. No pressure! Presented with such diverse collections representing so many peoples in Asia, it was challenging to know where to begin my research: did I choose a culture, region or type of object with which I was already familiar, or did I choose something entirely new to me? As it turned out, the answer was all of the above. 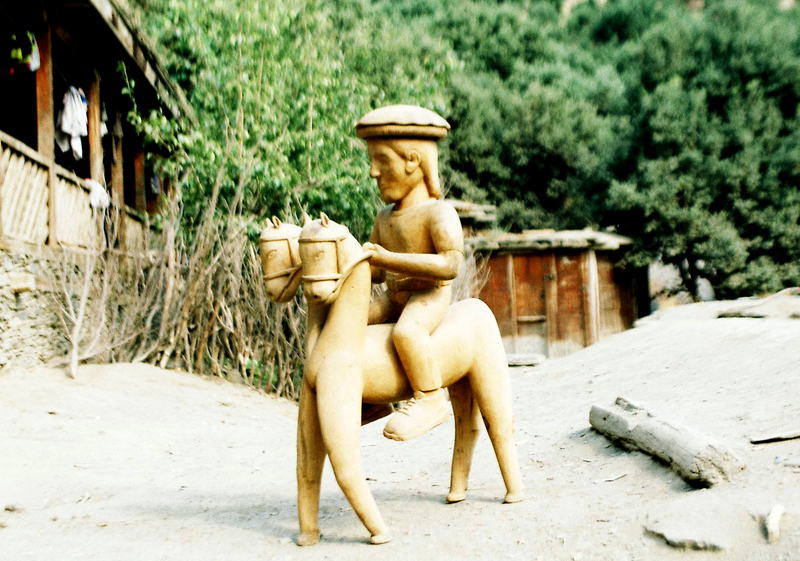 During my endless journeying across the store, my eyes were drawn to a group of carved wooden figures from Pakistan. They looked very different from everything else in the collections and I was intrigued by them. At the time, I did not know what they were or who had made them, but as my research progressed, an extraordinary story emerged connecting the Kalasha people with the Great Game and, most surprisingly of all, Alexander the Great. 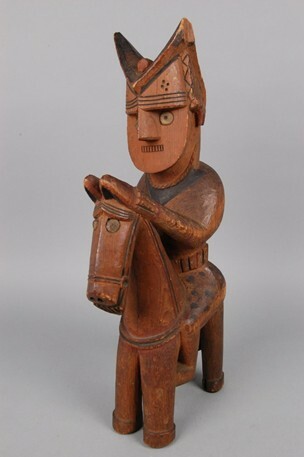 Although the figures closely resembled gandau – stylised, life-sized wooden effigies carved by the Kalasha people in Pakistan – they were far smaller. Gandau are often intricately carved, painted and draped with items of clothing, and the eyes are frequently inlaid with round white stones. Considered to be imbued with the spirit of the deceased, the figures are placed near coffins. They are not exact portraits of the deceased but generally uniform and stylised representations. There are three types: standing, seated, and equestrian figures. 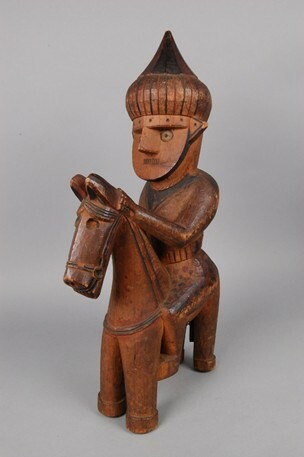 Male figures are more common than female ones, and are generally carved either standing or on horseback. 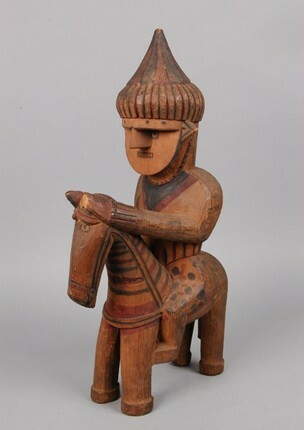 The horse is carved with either one or two heads. 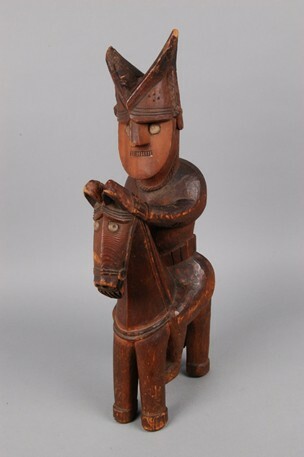 The two-headed horse figure is a particularly potent symbol of power, representing the highest status that can be accorded through a gandau to a Kalasha individual. Similarly, male figures carved wearing turbans denote authority and bravery. By contrast, women tend to be depicted seated on ornately carved chairs wearing caps with four horns. These horns refer back to the belief among the Kalasha that a goat born with four horns was an auspicious omen. The Kalasha language, dress and material culture is distinct from that of their Muslim neighbours, as are their religious beliefs – which are influenced by the ancient Vedic beliefs and practices – and funerary customs. 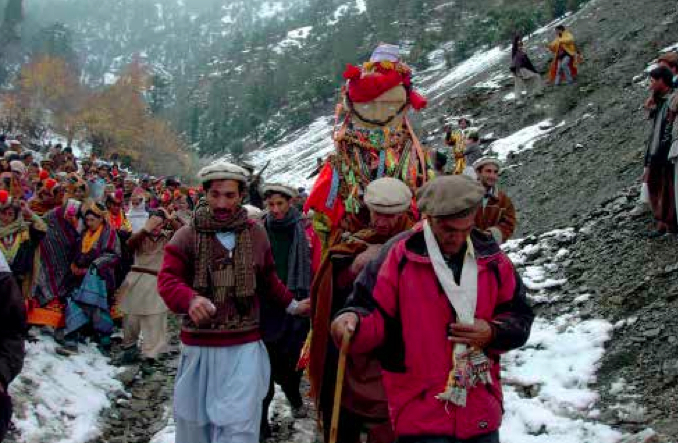 The Kalasha people live in Bumburet, Rumbur and Birir, which are three valleys in Chitral District, Khyber Pakhtunkhwa Province (previously North-Wester Frontier Province) in Pakistan, which borders the Nuristan Province of Afghanistan. This remote mountainous homeland contributed to their relative immunity from historical waves of religious change. 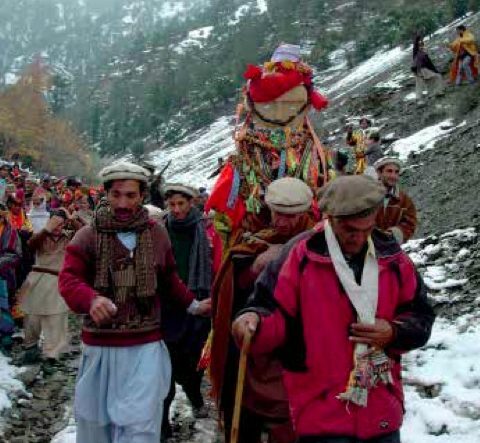 The same was not true for other polytheistic communities in Nuristan who, in the past, had belief systems, rituals, festivals and a number of cultural aspects in common with the Kalasha. This changed in 1895-96 when Emir Abdur Rahman Khan, Afghanistan’s ‘Iron Emir’, oversaw their enforced mass conversion to Islam. Up to this point, these communities were referred to as ‘Kafirs’ (‘unbelievers’) and the land in which they lived was called ‘Kafiristan’ (‘land of the unbelievers’). After their religious conversion, the Emir renamed them ‘Nuristanis’ (‘enlightened ones’) and the land ‘Nuristan’ (‘land of the enlightened ones’). Kalasha geographical isolation and the British control of Chitral at this time were some of the reasons why the Kalasha escaped the Emir’s attempts to convert them. The Kalasha people …and Alexander the Great? The Kalasha have various stories about their history and origins. Some claim descent from Alexander the Great and his soldiers who settled in ancient Arachosia, Gedrosia and Bactria. The story of a lost Hellenic people in these northwestern regions of the subcontinent has been repeated many times and over many years, including by Rudyard Kipling in The man who would be king (1888) – a story, incidentally, at least partly inspired by another fascinating character, the American physician and adventurer Josiah Harlan, who eventually contrived to have himself made king of Ghor in Afghanistan. The narrative concerning this Macedonian or Greek ancestry must have come from an outside source since it was not handed down through Kalasha oral tradition. How did this happen? The link between the Kalasha and Alexander the Great was made against a background of 19th century British incursions into the easternmost lands Alexander had conquered some two millennia earlier. It was also the period when Europeans discovered the ‘Greek’ art of Gandhara and the coins of the Indo-Greeks and Graeco-Bactrians in these northwestern regions of the Indian subcontinent. Amidst this came the swirling rumours of the discovery of a fair-skinned, blue-eyed, non-Muslim people living in mountainous isolation in this region. The earliest ethnographic studies of the Kalasha by H.W. Bellew (1891) and G.S. Robertson (1896) revealed that the Kalasha made no connections between themselves and Alexander the Great. In fact, it was Robertson who made the link. 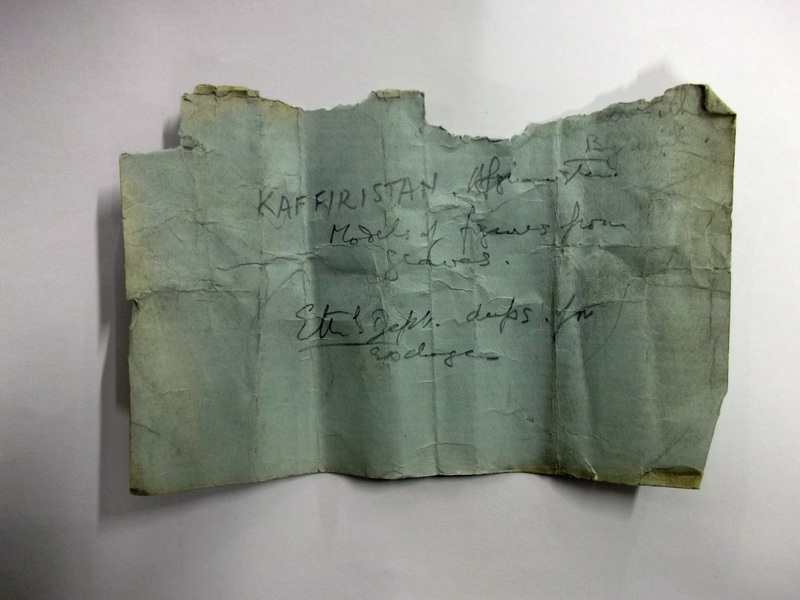 Sir George Scott Robertson (1852-1916) was an army doctor, traveller and political agent who travelled through Kafiristan between 1889-91. 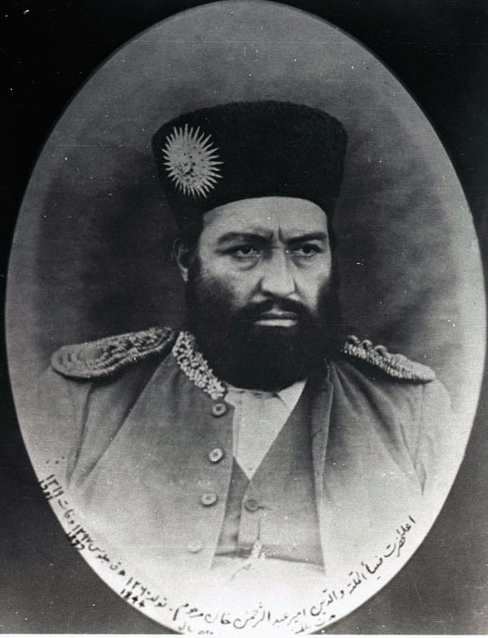 He not only served in the Second Anglo-Afghan War (1878-80) but was awarded the KCSI for his service during the Relief of Chitral in 1895. Notably, it was from Chitral in 1895 that the earliest gandau in the British Museum were acquired. 1-4. The 4 earliest examples of these funerary-related objects in the British Museum’s collection were acquired by Colonel G.C. Hodgson (Reg. no. As1951,01.1 & As1951,01.2) and Captain Hector Bethune (Reg. no. As1930,0130.1 & Reg. no. As1944,06.1), both of the 32nd Sikh Pioneers, during the Relief of Chitral in 1895. After this campaign, Hodgson and Bethune accompanied Sir Francis Younghusband (1863-1942) on the British Expedition to Tibet. 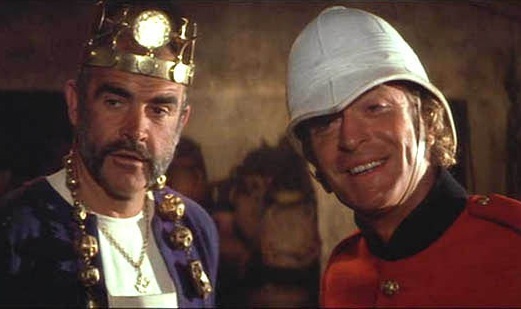 Bethune died in Tibet, while Hodgson was awarded the Edward VII DSO. 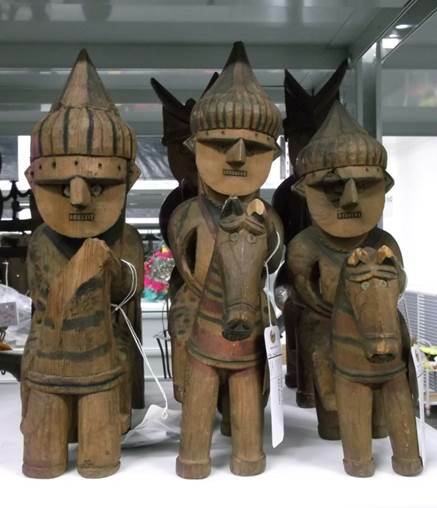 The 4 model gandau were then transported to India, before arriving in London and, finally, the British Museum. Interestingly, Frederick Bailey’s photograph of the Officers’ Mess in Ambala, India dated 1905, shows a model gandau (Claire Harris, The Museum on the Roof of the World: Art, Politics, and the Representation of Tibet, University of Chicago Press, 2012, p.72). 5-7. Captain J.P. Sulley commissioned 3 model gandau from the Kalasha people of Bumburet valley, Chitral in 1915-16 (Reg. nos. As1930,1023.1, As1930,1023.2 & As1930,1023.3) . The models arrived at the British Museum with a selection of photographs of the Kalasha people as well as some of their funerary and ritual sites. 8. Acquired by Lieutenant-Colonel G.P.T. Dean, who served with the 14th Punjab Regiment in Chitral in 1923 (As1963,14.1). 9. This model gandau was acquired by Lieutenant-Colonel S.H. Powell of the Royal Engineers who founded the Indian Signal Service (later the Indian Signal Corps) (As1931,1013.1). 10. H.G. 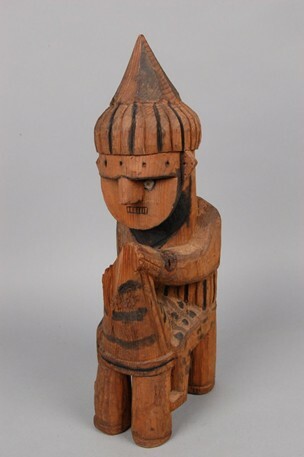 Beasley (1881-1939) donated this model gandau to the British Museum in 1930 (As1930,0613.1). It is not clear who original acquired it, or how Beasley came to own it. Beasley was a wealthy brewery owner and collector of mostly ethnographic objects, who established the Cranmore Ethnographic Museum in Chislehurst, Kent, with his wife Irene. After Beasley’s death, objects from this museum were later donated to the British Museum, and other museums. 11. 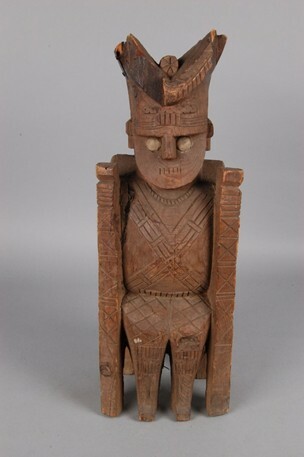 The collector of this model gandau is unknown (As1981,Q.45). It was acquired by the Museum in 1936 and two labels are associated with it. The first reads: ‘13 June 1936. 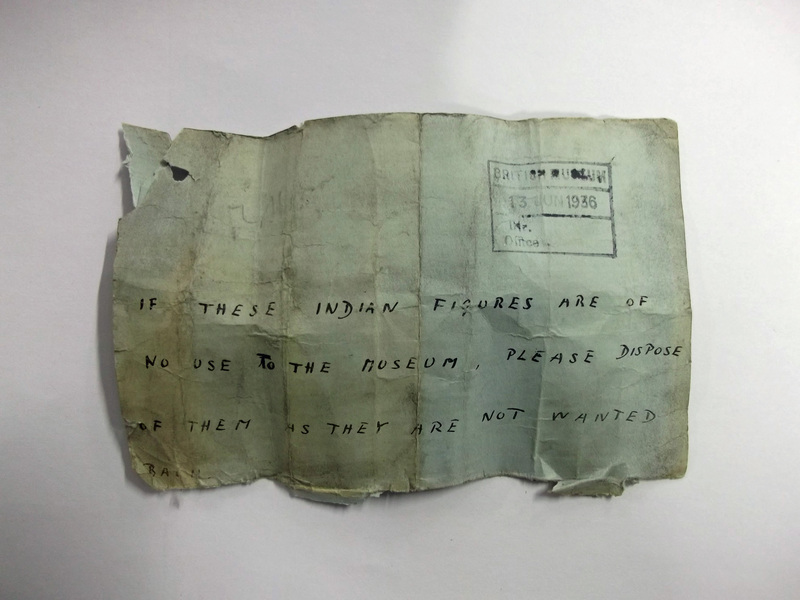 If these Indian figures are of no use to the Museum, please dispose of them as they are not wanted.’ The other reads: ‘Anonymous 1936 Kafiristan dup[licate].’ The second reads: ‘Kafiristan, Afghanistan. Models of figures from graves. Eth. Dept. dups [duplicates] for exchange.’ It is clear there were originally more of these model gandau in the collections, but only one was kept and the rest disposed of – perhaps through exchange with another museum. 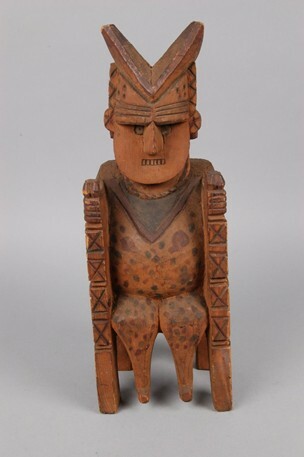 As seen from the collection history outlined above, the model gandau were acquired by soldiers. Why? 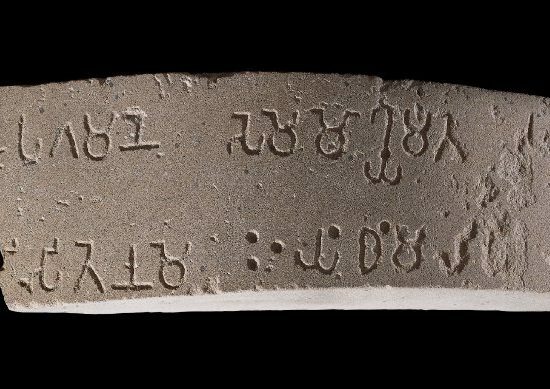 Military personnel stationed in the region would, of course, have the opportunity to acquire such pieces, but these objects appealed to them for a reason. The perceived link between the Kalasha and Alexander the Great was part of the nexus of assumptions about the region which informed British visitors from the late 19th century onwards. 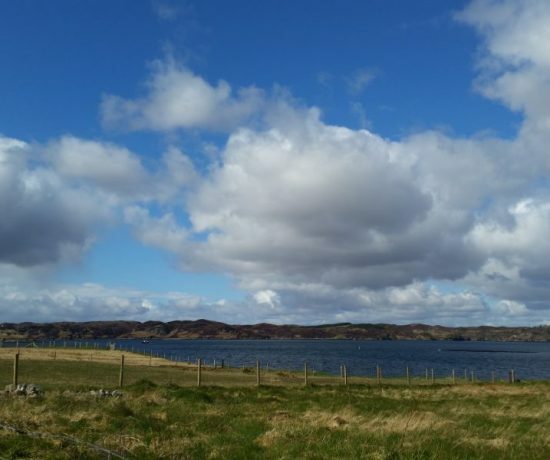 The men who acquired them were from the British officer class, whose education would have emphasised Graeco-Roman history, making them particularly susceptible to stories linking their empire with that of Alexander. 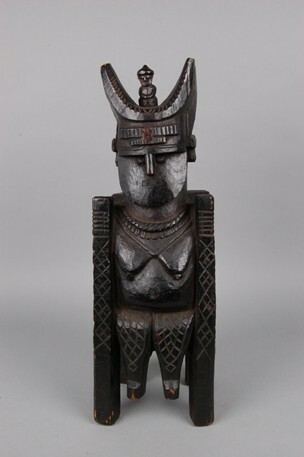 It is was this mythology surrounding the origins of the Kalasha that attracted the British officers to these objects as, perhaps for them, they embodied a palpable link with their illustrious predecessor and conqueror of the region. 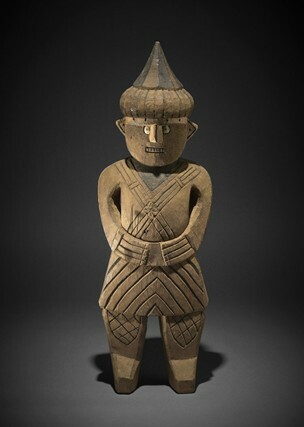 Gandau are traditionally carved life-size, but these are considerably smaller at c.50cm tall. 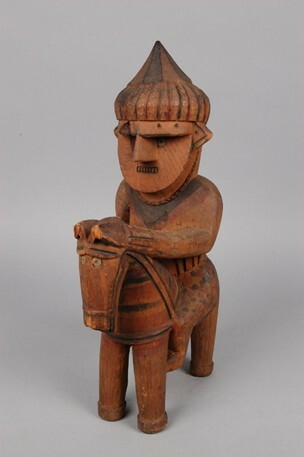 The Kalasha carved smaller human figures to place on top of shrine-posts, but a careful examination gave no indication that the Museum’s objects had ever been part of a shrine-post. It seems that model gandau had a different function in the culture of the Kalasha community. 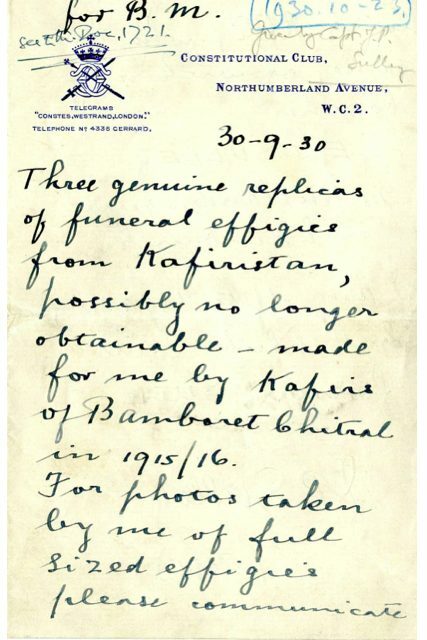 A letter found among the photographs donated by Capt. 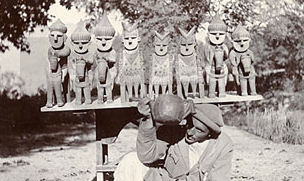 Sulley was revealing: ‘Three genuine replicas of funeral effigies from Kafiristan, possibly no longer obtainable – made for me by Kafirs of Bomboret [Bumberet] Chitral in 1915/16.’ One of his photographs portrayed a man wearing a traditional Kalasha wool cap standing in front of 8 model gandau that very closely resemble those in the Museum. It seems likely that the Kalasha made these especially for sale to eager British customers. Thus the Kalasha’s distinct culture – including material culture – gave rise to a market for their cultural artefacts which caused a demand-led transformation of how they themselves interacted with these objects. In Kalasha culture today, gandau models remain significant and relevant. 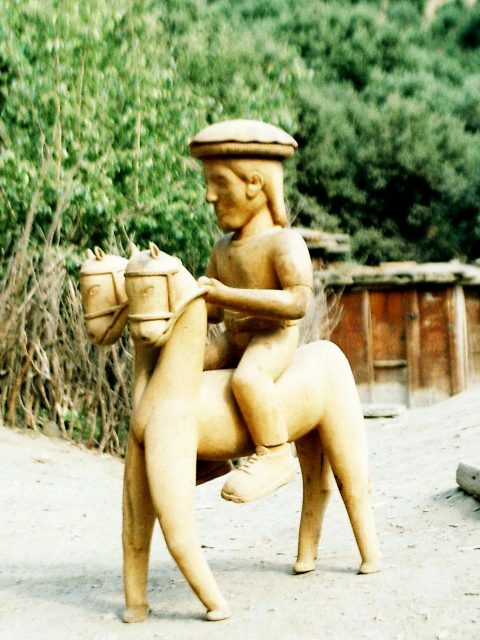 Rehmat Wali, a contemporary sculptor living in Kalashgram village in Rumbur valley, makes his living from carving gandau as funerary effigies, souvenirs and also as works of art. He has introduced changes to the traditional way in which gandau were carved, for example, he carves some of them with the traditional, everyday woollen caps that Kalasha men wear instead of the martial pointed turbans of older generations. The custom of commissioning these objects for funerals is in decline because it is very expensive. This makes the creation of gandau as souvenirs and works of art more important as sources of income. Rehmat Wali learned his carving skills from his father, who in turn had travelled to Prashun valley in Nuristan Province to learn his art. The carvers in Prashun were noted for their ability to carve gandau from a single piece of wood. This transfer of knowledge across geographical, political and cultural boundaries has essentially ground to a halt, but the craftsmanship survives and continues to change and develop. While gandau are still being commissioned and made for their original purpose, the other form of production, initiated through contact with soldier-collectors in the 19th century, continues to feed the foreign, increasingly tourist-driven market. These beautiful, striking objects have become souvenirs or works of art in their own right, depicting a people in transition. It was this talk that I gave to Neil MacGregor and the Department of Asia.Happily, it was well-received and he asked me to write an article based on my research for the British Museum Magazine. If you would like to read more about these fascinating objects and the people who made them, you can find a link to the magazine article here. When I was first researching the model gandau, Tom Crowley was kind enough to read through my work and share his expertise with me. He also introduced me to Luke Rehmat who, in turn, allowed me to publish his photographs in the original article. Zulfiqar Ali Kalhoro, of the Pakistan Institute for Development Economics (PIDE) generously shared information he had gathered from Rehmat Wali. I thank them for their help. All mistakes, however, remain my own. There are two model gandau at the Horniman Museum. Reg. no. 16.3.63/6 came from the Berkeley Galleries in 1963, while Reg. no. 30.6.53/36 came from the Wellcome Collection in 1953. (My thanks for this information to Tom Crowley, Curator of Anthropology, Horniman Museum). There are two at the Science Museum that were originally part of the Wellcome Collection. Reg. nos. A119854 and A119550. Both were purchased from Stevens Auction Rooms, and it is not clear who acquired them originally. (My thanks for this information to: Heena Rabadia, Science Museum; Rowan De Saulles, Wellcome Library). 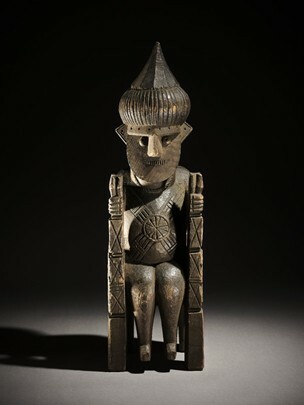 Notably, while the Pitt Rivers Museum does not have any model gandau among their collections, they do have a gandau on permanent display in their galleries. Z.A. Kalhoro, ‘Art of Loss’, The Friday Times, August 10-16, 2012, vol.XXIV, No.26. 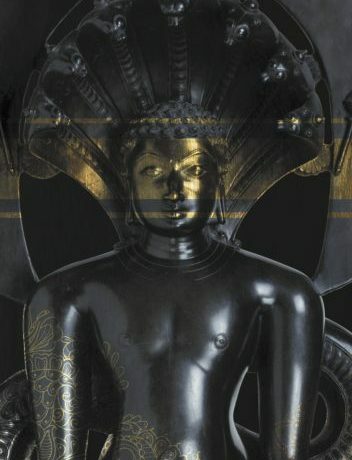 S. Jansari, ‘Making Myth a Reality’, British Museum Magazine, Spring/Summer (2014), pp.48-51. The Horniman Museum holds a collection of Kalasha women’s costumes that were collected by Tom Crowley, Curator of Anthropology. Luke Rehmat, Founder and CEO of the Kalasha People’s Development Network. I have two, “collected” by Colonel Lindsay Emmerson, an army doctor in India some time between the wars. Sorry no pix, they’re currently in storage. Hi Lucy, How interesting! Thank you for sharing the information. I have often wondered just how many are still sitting about in peoples homes… there must be quite a few! Some occasionally come up in auctions as well. Its really a good piece of writing and research, a new addition to the Kalasha Studies. Once Urtsun and Jinjiret Koh were also Kalasha valleys, now converted. There are some leftovers of material culture related to Kalasha which would soon be vanquished. I recent paid a short visit to Jinjiret koh where the people do not like to recall their past. It was really very hard to conduct some interviews reading their past. Mureen Lines tired to established a little collection (of Kalasha objects) in Jinjiret Koh which is now in pathetic, after death of Miss Mureen.